The Telugu Titans in the second half of the Pro Kabaddi League (PKL) season 5 saw a lively game but could not overcome Puneri Paltan. Puneri Paltan defeated Telugu Titans 42-37 in this inter-zonal match played at Netaji Subhash Chandra Bose Indoor Stadium. One time Titans's team was trailing 0-18 but in the last 10 minutes of the first half and the second half, he made a great comeback but Pune somehow managed to win this match. 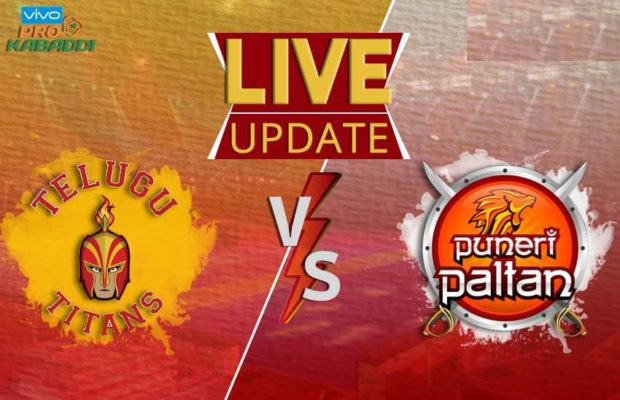 Puneri Paltan started the best and continued for 18 points. Meanwhile, the team of Telugu Titans could not take a single digit. The team was once all-out. Its captain and PKL's most successful raider Rahul Chaudhary also could not open the account till 9th minute of his team. In the ninth minute, Pune failed to make Rahul Raid all the time. Although here Telugu Titans got a score in the account. Then go and open its account. After opening the account, They got Pune all-out at 10-23 in the 14th minute. Although Telugu Titans made the mistake of not taking the points in the initial minutes, due to which they could not reduce the difference of points in the first half and Pune's team went on to the first half with a 26-12 lead. In the second half, Telugu Titans improved his game and kept taking the score. However, Puneri Paltan was also taking consecutive points. Pune was ahead of 14-31. In the 26th minute Deepak Hooda got Raid and earn two points in Titans' bosom. Here the titans had given the referee an all out, but Titans demanded a review which was successful. There were two points in the Titans part and the score was 16-31. However, in the next minute, **Puneri Paltan** failed to make Raid out, Pune had allotted Titans and then Deepak Hooda gave Pune a 37-14 lead with three points from successful Raid. Pune's team was ahead in 39th-30th minute. From here the match took an exciting turn. Telugu Titans showed his passion. Iran's Mohsen scored three points on the Titans' account of a successful Raid, and then Rahul scored three points in the 33rd minute to score 27-39. Two minutes later, Rahul play another successful Raid, with scores of three points to score 30-40. From here the Titans took three consecutive points and brought the difference of numbers to seven. "Telugu Titans" scored 35-41 and the way he was playing seemed to beat Pune. Only two players from Pune team were on Matt, and in the 38th minute, Rahul came to beat the Raid. Rahul had a chance to get out of Pune but he himself became a victim of super tack. Pune got two points and in some way Puneri Paltan won the match.